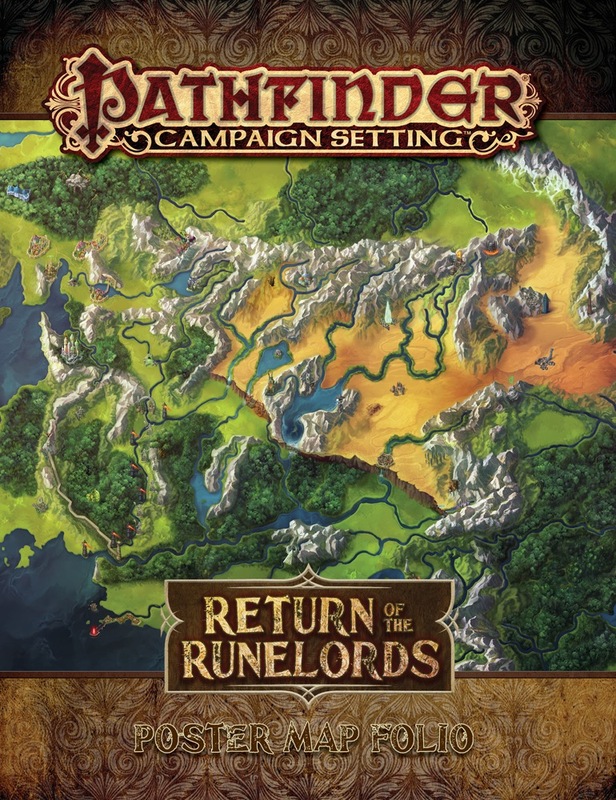 In Return of the Runelords, adventurers go from a sleepy town to the ruined capital cities of an ancient empire that seem pulled out of time itself–explore the mysteries of the past and present with these new maps. Ancient Thassilon is one of the first big empires in Pathfinder. With the help of the Runelords–ancient, extraordinarily powerful magic-users who have been sealed away for centuries (if not millennia) now newly awakened to reshape the world, the nation will soon be reborn. Explore its lost splendors, as well as the humble beginnings of the Return of the Runelords Adventure Path with a new Map Folio, coming February to Pathfinder. From humble beginnings in a quiet coastal town, the Return of the Runelords Adventure Path travels to ruined capital cities and explores the mysteries of ancient Thassilon. With the Return of the Runelords Poster Map Folio, you can bring two of these cities to life with a pair of massive poster maps, and also discover the lost wonders of the nation of Thassilon itself! These huge, lavishly illustrated poster maps depict two important urban centers from the Return of the Runelords Adventure Path. The first map details the settlement of Roderic’s Cove, where the Adventure Path starts. The second map explores a mysterious ancient city, while the third is a beautifully illustrated map of the ancient nation of Thassilon as a whole. Whether you’re looking for a small seaside town, a sprawling urban center, or an entire nation, these beautiful maps are the perfect resource for the Return of the Runelords Adventure Path or any fantasy campaign. The Map Folio is expected to release in February, but you can pre-order it today. Enjoy exploring ancient Thassilon–and as always, Happy Adventuring!